Develop your jazz guitar soloing skills with this comprehensive video taught by MI instructor Sid Jacobs. Topics covered include: three-octave diatonic scale patterns - triad pairs - common jazz phrases - guide tones - fourths - and more. Approx. 60 minutes. 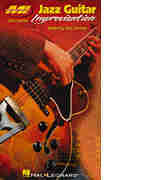 Sid Jacobs organized the curriculum for the Jazz Guitar elective at Musicians Institute (G.I.T. ), and continues to teach at the school. Sid currently divides the rest of his time as a product consultant, clinician, and performing artist.